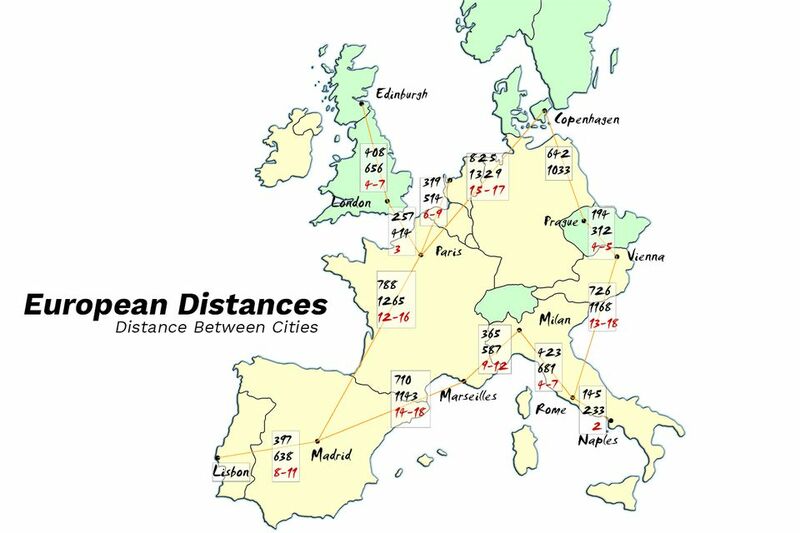 Many people planning travel in Europe are confused by the distances between the major cities. I've prepared the map in this article to show the driving distances in miles, kilometers, and the rough train times you can expect to encounter when you travel between cities. The top number in each box represents the distance in miles between the cities when taking the major roads. The second number represents the distance in kilometers, and the red number indicates the number of hours a regional train may take between cities - if it's on schedule. Countries shown in yellow on the map use the Euro (€), while countries in green use local currency (see our European Currency Quick Guide for more on the currency). Perhaps you'd like to have experts do everything. You might look into these extended tours of European countries by Viator. See distances and compare journey times for some of the most popular routes in Europe. Driving: 18h Train: Very difficult. Driving: 10h Train: Very difficult.